Devic's disease also named neuromyelitis optica (NMO) is an acute demyelinating disorder combined with severe attacks of optic neuritis and transverse myelitis. Although NMO predominantly affects middle aged adults, pediatric case reports of NMO are increasing in recent years. These recent case series of pediatric NMO revealed strong female predominance. NMO has specifc diagnostic criteria and unique pathologic features compared with multiple sclerosis (MS). We present a NMO case of a 10-year-old girl with bilateral optic neuritis, cerebral and spinal cord involvement. A previously healthy 10-year-old girl was admitted to our department for sudden loss of vision in her left eye. The best corrected visual acuity (BCVA) was counting fingers in the left eye and 1.0 (Snellen Chart) in the right eye. Fundoscopy revealed left optic disk swelling. Brain magnetic resonance imaging (MRI) was normal. Two months later acute severe visual acuity loss occured in her right eye combined with quadriparesis. Ophthalmic examination revealed bilateral impaired pupil response. Her BCVA was counting fingers in both eyes. Biomicroscopic examination was normal. Fundus examination showed right optic disc swelling with left optic atrophy [Figure 1]. On fluorescein angiography that was performed at the onset of her right eye's symptoms, a leakage was seen at the late phase of her right eye [Figure 1]. On systemic examination, her blood pressure was 90/65 mmHg, pulse rate 85/min, and axillary body temperature 36.7°C. Neurological examination revealed weakness of both upper and lower limbs. A bilateral positive babinski sign was noted. Other cranial nerves and cognitive functions were normal. Laboratory work-up revealed normal hematocrit, white blood cell counts, platelets, and erythrocyte sedimentation rate. Analysis of cerebrospinal fluid (CSF) revealed a clear colour, protein 44 mg/dl, and sugar 79.4 mg/dl. Oligoclonal bands were positive. Visual evoked potential (VEP) study showed prolongation of P100 latency and amplitude loss in both eyes [Figure 2]. Electroretinogram was normal. MRI revealed abnormalities of spinal cord signal and longitudinal syringomyelia cavity from bulbus to thoracal 9 with hypointensity in T1-weighted images and hyperintensity in T2-weighted images along the spinal cord as a result of longitudinally extensive myelitis [Figure 3]. The cerebral region was normal at the onset [Figure 4]-upper images. 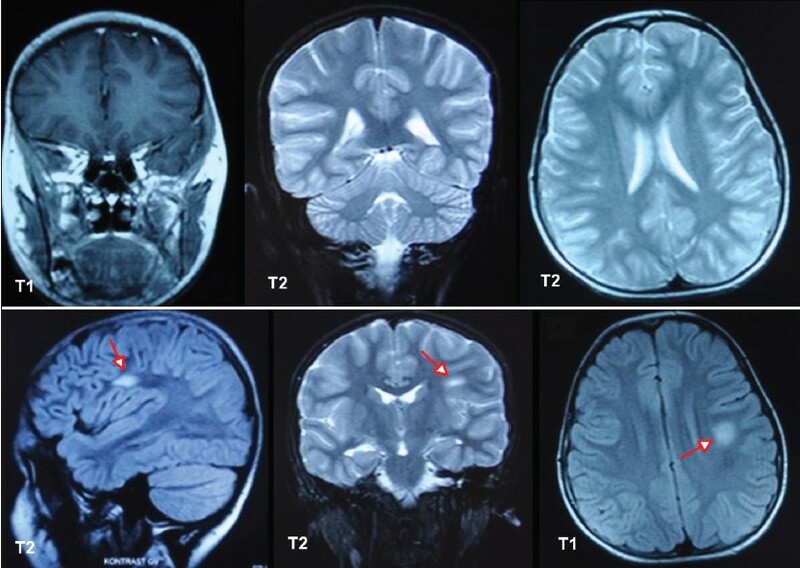 But 3 months later a demyelination plaque was seen in the left posterior frontal lobe [Figure 4]-lower images]. NMO-specific serum autoantibody against the water channel aquaporin-4 (Aqp4) was positive. Mitochondrial G3460A, G11778A, T14484C mutations were negative and proper distinction of NMO from Leber's hereditary optic neuropathy was done. A diagnosis of Devic's disease was made and the patient was treated initially with intravenous methyl prednisolone (650 mg/day for six days) followed by gradually tapered oral steroids. One month later 2 mg/kg/day azathioprine was added. 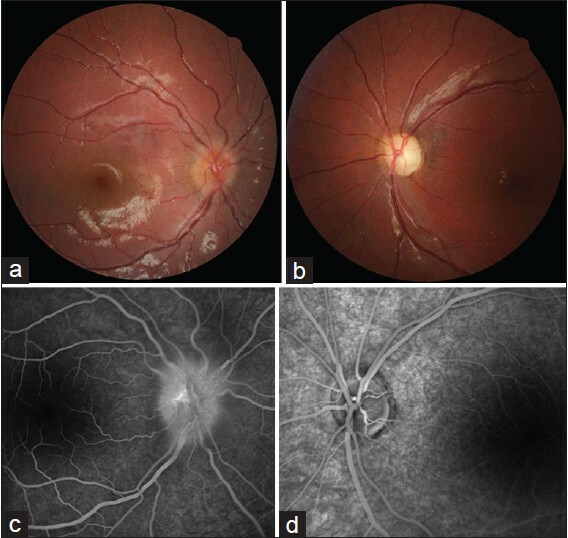 Pulse methyl prednisolone therapy was repeated three times totally but clinical outcome was not favorable with significant bilateral optic atrophy [Figure 5]. NMO can occur in children but pediatric NMO needs specific consideration owing to possible poor visual and motor outcome. Within 5 years of disease onset, more than 50% of the patients with relapsing NMO are blind in one or both eyes. Likewise our patient was legally blind as a result of the three attacks in 6 months. Latest studies suggested that NMO which had been previously thought of as a variant of MS is different from MS. ,, However, no gold standard diagnostic test has been described to distinguish those clinical entities. Attacks in NMO commonly spare the brain in the early stages in contrast to those in MS. Furthermore, normal brain MRI is a common finding at the onset of NMO  and follow-up scans must be performed periodically for later lesions (usually asymptomatic) in the course of the disease. However, some limited number of patients may be present with brain symptoms with brain lesions as their first manifestation and develop recurrent brain symptoms without ON or myelitis. Brain MRI that was performed in patients with NMO reveals that gray matter is more affected than white matter unlike MS which affects only white matter. Spinal cord lesions are usually large, extending over three vertebral segments in about 85-90% of patients and are mostly located in the cervical and upper thoracic region. , Current revised diagnostic criteria of NMO includes the presence of acute optic neuritis and myelitis with at least two of the three supportive criteria, which consist of spinal cord MRI lesion extending over three vertebral segments, brain MRI lesion, which does not meet the diagnostic criteria for multiple sclerosis, and NMO-IgG seropositive status. The NMO-IgG autoantibody was 76% sensitive and 94% specific for the diagnosis of NMO. The detection of this antibody distinguish the NMO from nearly all other demyelinating disorders. NMO-IgG binds to Aqp4 which is the main channel that regulates water homoeostasis in the central nervous system. The presence of antibody against to Aqp4 may be associated with other autoimmune diseases such as thyroiditis, systemic lupus erythematosus, or Sjogren's syndrome. However, our patient has no systemic disorder or non-organ-specific autoimmune disorder or autoantibody. At the time of the right eye's involvement, our patient fulfilled the diagnostic criteria. CSF examination characteristically shows pleocytosis >50·10 6 WBC/L in patients with NMO. , However, this profile is not specific and is usually present in about 10-20% of the patients. Our patient's CSF analysis did not show significant pleocytosis. Oligoclonal bands of IgG in the CSF are frequently seen in MS and these are detected in 15-30% of patients with NMO. Oligoclonal bands were positive in our patient's CSF examination. There is no proven treatment protocol either in the acute attacks or in the long term remissions in NMO. Intravenous corticosteroid therapy is the commonly prefered initial treatment for acute attacks. A total of 50% of the patients who are unresponsive to corticosteroid treatment may benefit from plasmapheresis. The efficacy of immunomodulatory therapies (Beta-interferon) have not been proven yet. However, immunosuppressive therapy (oral azathioprine, associated or not with oral steroids; intravenous immunoglobulin; Rituximab) is an accepted method to provide clinical remission of corticosteroid resistant NMO. 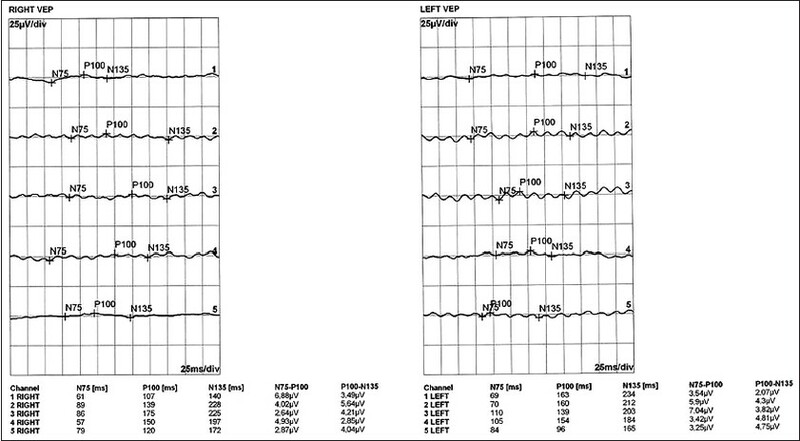 Although acute attacks of our patient were successfully treated with the pulse corticosteroid therapy with methylprednisolone and azathioprine, no improvement was observed in BCVA of both eyes and motor function. NMO is a rare, devastating disease affecting both visual and neurological system resulting in blindness and plegia in children. Treatment of pediatric NMO is mostly based on clinician's experience in light of other adult studies. Further long term studies primarily focusing on children are needed. 1. Wingerchuk DM, Lennon VA, Pittock SJ, Lucchinetti CF, Weinshenker BG. Revised diagnostic criteria for neuromyelitis optica. Neurology 2006;66:1485-9. 2. Tillema JM, McKeon A. The spectrum of neuromyelitis optica (NMO) in childhood. J Child Neurol 2012;27:1437-47. 3. Barnett MH, Sutton I. Neuromyelitis optica: Not a multiple sclerosis variant. Curr Opin Neurol 2012;25:215-20. 4. Chan KH, Tse CT, Chung CP, Lee RL, Kwan JS, Ho PW, et al. Brain involvementin neuromyelitis optica spectrum disorders. Arch Neurol 2011;68:1432-9. 5. Wingerchuk DM, Lennon VA, Lucchinetti CF, Pittock SJ, Weinshenker BG. The spectrum of neuromyelitis optica. Lancet Neurol 2007;6:805-15. 6. Yu CS, Lin FC, Li KC, Jiang TZ, Zhu CZ, Qin W, et al. Diffusion tensor imaging in the assessment of normal-appearing brain tissue damage in relapsing neuromyelitis optica. AJNR Am J Neuroradiol 2006;27:1009-15. 7. Krampla W, Aboul-Enein F, Jecel J, Lang W, Fertl E, Hruby W, et al. Spinal cord lesions in patients with neuromyelitis optica: A retrospective long-term MRI follow-up study. Eur Radiol 2009;19:2535-43. 8. Matà S, Lolli F. Neuromyelitis optica: An update. J Neurol Sci 2011;303:13-21. 9. Bergamaschi R, Tonietti S, Franciotta D, Candeloro E, Tavazzi E, Piccolo G, et al. Oligoclonal bands in Devic's neuromyelitis optica and multiple sclerosis: Differences in repeated cerebrospinal fluid examinations. Mult Scler 2004;10:2-4. 10. Wingerchuk DM, Weinshenker BG. Neuromyelitis optica. Curr Treat Options Neurol 2008;10:55-66.